The Toorak RSL, also known as the Heroes Club, is located in what otherwise appears to be a quiet residential street in the inner Melbourne suburb. Enter through an unassuming door and walk down a short corridor between display cases containing several military uniforms and you’ll find a small bar, the walls lined with prints and paintings of aeroplanes, ships and men in uniform. I think I even spied a small chunk of wood on display which is said to come from Lord Nelson’s flagship, HMS Victory. 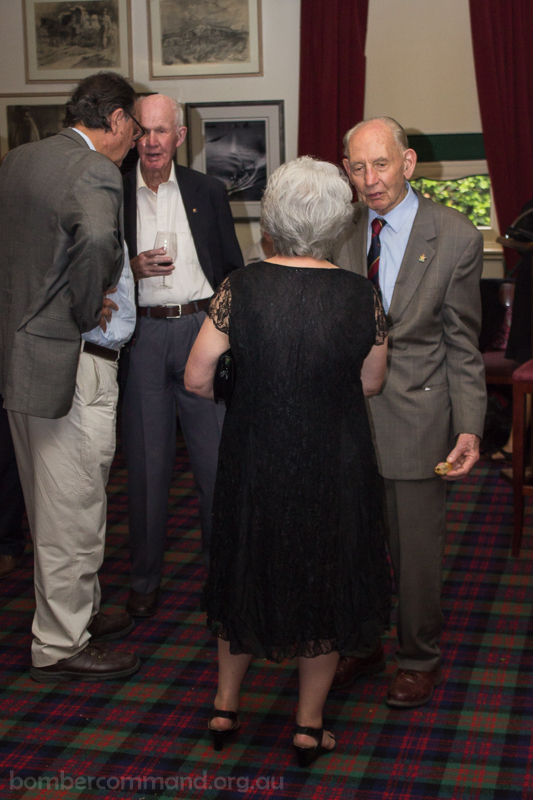 It’s a very traditional RSL Sub-Branch and, in short, it is quite the venue for the Bomber Command Commemorative Association’s now-annual cocktail party, the 2016 edition of which was held on Wednesday night, 9 March. Almost 50 people attended a wonderful night of conversation and friendship over a wine or a cold beer or two. 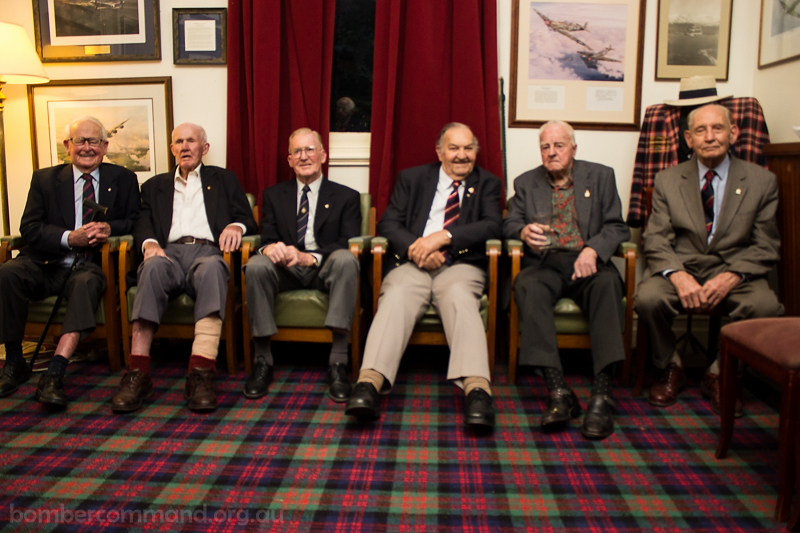 We were lucky enough to have six veterans of Bomber Command present. 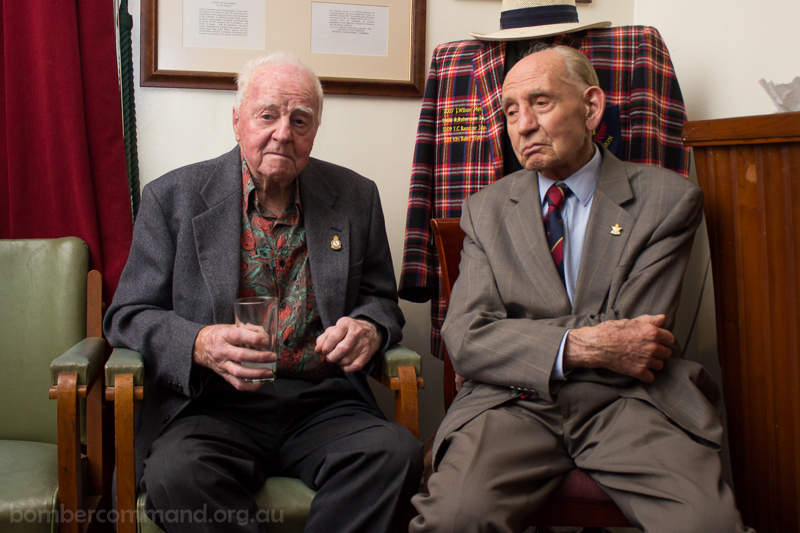 Col Fraser told us how he’d caught a train and two trams to be there, Arthur Atkins and I discussed motorbikes (he used to ride a 350cc Calthorpe) and Gerald McPherson had been to an earlier lunch at the Melbourne Cricket Club and was still wearing his MCC tie. They were joined by Maurie O’Keefe, a wireless operator who post-war restored the radios currently inside G-George in Canberra, Don Southwell, all the way from Sydney just for the night along with his son David, and Laurie Williams, with whom I had an interesting conversation about how flying instructing could sometimes be more dangerous than a tour of ops. Acknowledging the veterans as the primary reason for our being there that night during a short speech, BCCAV Chairman Paul Dipnall requested that they each put up their hands to be recognised. With the characteristic modesty that I’ve come to associate with the men of Bomber Command, however, when the call came most of them did not raise their hands and instead had to be pointed out by others in the crowd. Then came the raffle, which has become a highlight of this function. 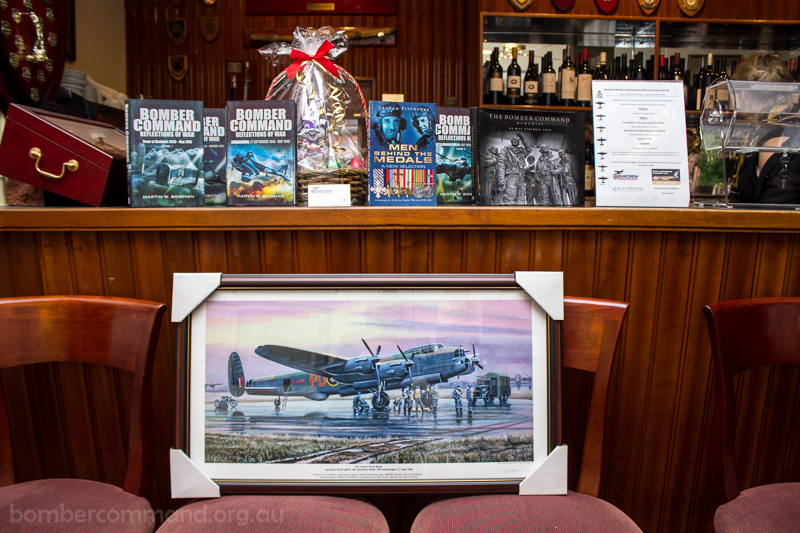 The main prize was a framed print of Avro Lancaster B for Baker, donated most generously by artist and all-round nice guy Steve Leadenham and brought to Melbourne as their checked baggage by Don and David Southwell. The print did not look out of place surrounded by the other examples of fine aviation art adorning the walls of the Heroes Club and it generated much interest – and additional ticket sales. Other prizes included an Easter basket from Jan Dimmick. The tickets were drawn from the barrel and the prize winners were all chuffed, not least Rosemary Robertson who claimed that magnificent print. One other piece of official business was taken care of on the night. 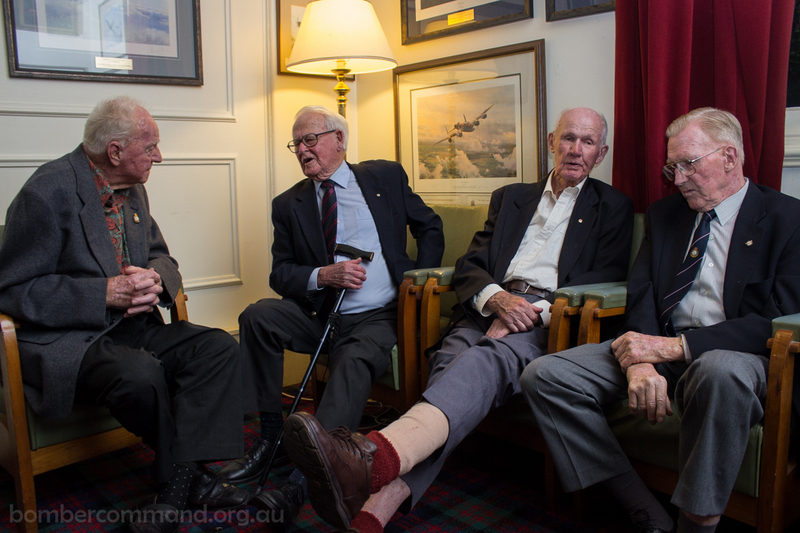 At 18:30 precisely, www.bombercommand.org.au – this, the brand-new website of the Bomber Command Commemorative Association (Victoria) Inc – went live. The launch was officially announced during the cocktail party. 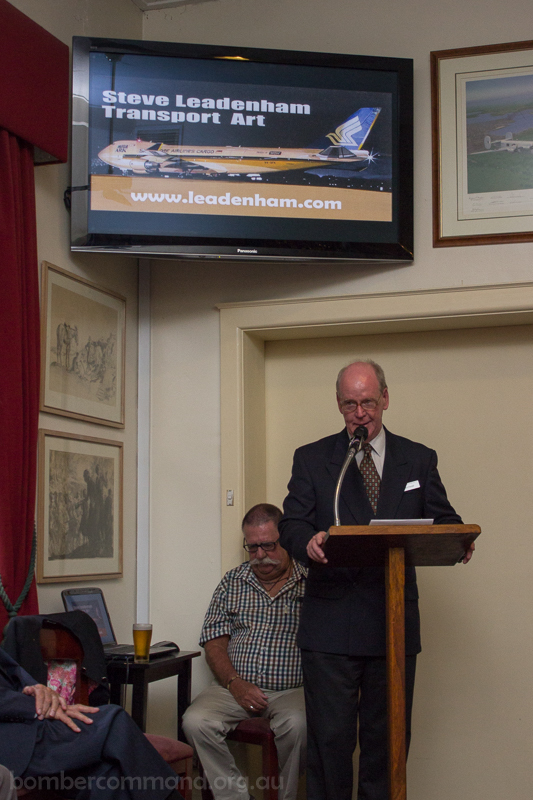 It is planned that the new site will become an integral asset for the Association as it develops and grows into the future, and it was a real thrill to be able to make the announcement at an event such as this. It was raining softly as my partner Rachel and I left the Club. The street lights reflected on the wet road as we reflected on a very enjoyable evening. This was the second year that this event in Melbourne has been staged.